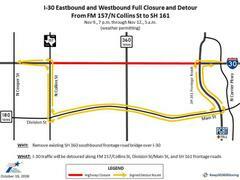 Traffic Alert: I-30 closure this weekend, starting at 7 p.m. Friday, Nov. 9, through 5 a.m. Monday, Nov. 12. To safely perform work on the Keep30360Moving Project, I-30 will be closed to traffic between FM 157/Collins Street and President George Bush Turnpike from 7 p.m. Friday, Nov. 9, through 5 a.m. Monday, Nov. 12. Traffic will be detoured along FM 157/Collins Street, SH 180/Division Street/Main Street, and President George Bush Turnpike. Expect significant delays.